Classic Tornado Foosball Table | Fun! 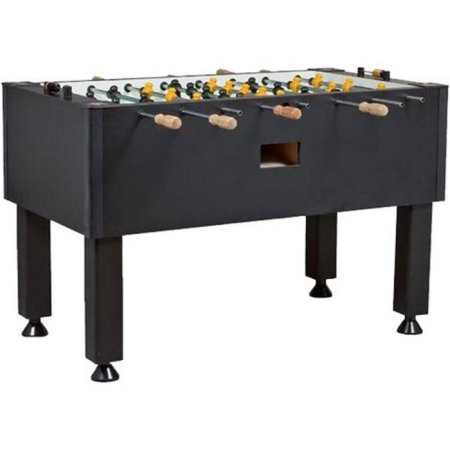 The Classic foosball table is a new 2010 model that replaces the Storm II table. The Classic table combines a contemporary look with heavy duty construction. The Classic table has just about every feature we look for when we review a table for high quality parts. Many of the high performance parts from Tornado’s commercial tables provide professional play quality on the Classic. The wooden handles are easy to grip and the rods are chrome plated, yet light in construction for quick rod movement. The tabletop surface is solid, level, and allows for fast foosball shots. The counterbalanced foosball men allow you to easily play 1 on 1 games because you can set the men horizontally without the fear of them falling down and getting in your way during game play. Leveling the foosball table with the adjustable leg levers is a breeze. This updated model includes a redesigned player foot which allows more precise ball control with higher cross hatching and square sides. A new thinner inner bearing design does not allow the ball to be passed between the man and the wall.